The Gorloks lost junior outside hitter Jenny Howard after a right knee injury for the second time this season. Against the Maryville University Saints, Howard said she was trying to stop herself from going under the net during the second set. Her right knee gave out as she shifted her weight away from the net. Howard sprained her medial collateral ligament (MCL) earlier this season and missed almost four weeks. After Howard received treatment in the locker room, she returned to the bench with her right knee wrapped in ice, cheering the Gorloks on. The Gorloks defeated the Saints in four sets. In the first set, the Gorloks were behind 17-22. The team capped off four straight points against the Saints to cut the deficit to one, but the Gorlok rally fell short in the first set, 25-23. Junior middle hitter Sam Kersting had a team-leading five kills in the first set, and 12 total in the game. After Howard left the game, the Gorloks responded and took home the second set, 25-18. Kersting said the transition to fill her role was easy because the team was already used to not having Howard in the lineup. Volleyball Head Coach Merry Graf said the team responded well to Howard’s injury. The Gorloks gave up a 24-21 lead in the third set after Maryville outside hitter Laura Welling delivered three straight kills. Junior middle hitter Emily Ratkewicz fired two straight kills for a third-set Gorlok winner, 31-29. Graf told her players winning the third set was huge, and it could inspire a lot of confidence for the team down the road. Gorloks won the fourth and final set, 25-16. 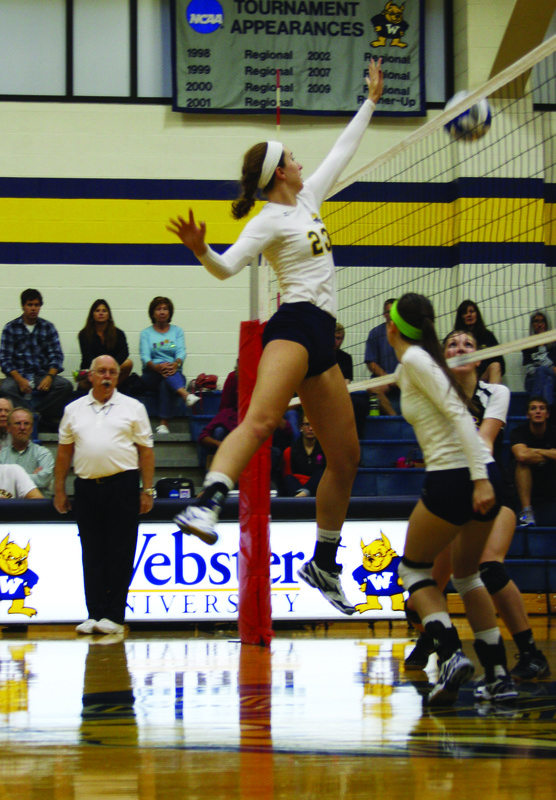 The volleyball team will play three doubleheaders from Oct. 4-12. Kersting said the amount of doubleheaders is a little crazy, but she doesn’t mind playing them. Graf said the team does not see the doubleheaders as a big deal because most of the players have played club volleyball. The Gorloks played their St. Louis Intercollegiate Athletic Conference (SLIAC) opponent, the Fontbonne University Griffins, before the Maryville match. The Gorloks won in consecutive sets: 25-17, 25-15 and 25-5. “Anytime you get a conference win, it’s a good win,” Graf said. The Gorloks improve to 15-4 overall, and 9-1 in the SLIAC. The team continues its six-game homestand against Augustana College (Ill.) on Oct. 11 at 6 p.m. The loss ends the season for the volleyball team, a squad which included nine seniors.